Chocolate cake… yum, who does not love chocolate cake! 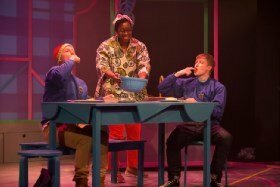 This 50-minute production of Chocolate Cake is absolutely delightful, it tickled all of my senses. Well done Polka Theatre. There is quite a bit of audience engagement. “Who is the queen of Holland?” is asked and to that, the response back is “Queen Juliana is a fat banana”. My little 6-year-old boy who is sitting next to me is sent into a frenzy of laughter. The audience is cheering on the winner of a bake-off, who wears a pointy gold crown with a delicate pink ribbon wrapped around the edge of it, whilst she holds an ice cream shaped trophy. The cast’s performance is really good, it is almost as though the play is written for them. Mark Houston plays Michael exceptionally well, he acts from the heart and you almost forget that he is an adult playing a child. Todd Heppenstall who mainly plays the role of the brother acts out tantrums and sulky moments very well too. He does this without taking any of the limelight off Michael, the main character. Aminita Francis who plays Mum (and Miss Goodall) puts a smile on my face when she starts to sing – such a beautiful voice and such a lovely character. The music is very catchy and the lyrics too are fun. The stage set is very creative, and the set is adapted for the different scenes with a slight tweak here and there – which is very impressive. The set is brought to life by the colourful lighting, almost turning the atmosphere into a warm comforting feeling, like you’d feel after eating chocolate cake. I’m really not sure what more one could cram into a 50-minute production. This is an awesome play that has given my little boy and I that moment of pure satisfaction of indulging in pure rich scrumptious Chocolate Cake! As Michael Rosen says ‘A deliciously tasty show’.